Healing through worship. I’m going to talk a little bit about worship right in the beginning, before the sermon, maybe two minutes or so. There’s a Korean word, a very interesting word. It is called “MuLib”, meaning total immersion. That’s what worship is. Total immersion from the beginning to the end. Worship is not what you do, what you do is meaningless. Worship is not the action. Worship is not what you do. Worship is your heart, your spirit meeting God’s spirit. So, without that total immersion, without MuLib, we cannot have worship. I mean, you can do all the actions of worship, all the motions of worship, but it is possible that you never worship God in your entire life. When there is no immersion, there is no worship. To this year, hopefully, that from the beginning to the end, we made totally immersed into God’s presence and have meaningful and good worship. If we learn how to worship our life will change. Our spirituality will change. Only through the worship, healing is possible. Only through the worship real spirituality is possible. I think hope is very important to live a good and meaningful life. Those who have hope will handle life’s difficulties much better than those who have no hope. People who have hope know how to wait. When I see people who live with hope, they know how to wait, they know what it means to wait. This waiting is very important. A hope and waiting can be interchangeable. When you look at NRSV, it says those who wait for the Lord, it’s the same Greek, same verse, but in NRSV says those who wait for the Lord, but in NIV, those who hope for the Lord. So, hope and wait are interchangeable. Ability to wait is a very important quality in your life you should learn, not only to survive but also to thrive in your life. When things don’t work out as you wish and very well, wait. Learn to wait. It will work out and eventually everything will fall into place. When you have problems and you don’t know how to solve your problems, wait. Somehow, you’ll find the wisdom to deal with your problem. Waiting is a secret key to your life. When you learn the art of waiting, the wisdom and power will be given to you, and then you will rise up like an eagle. This is hidden to those who cannot wait. This is hidden to those who don’t have hope, but to those who know how to wait, they will find this wisdom and strength in their lives. This is what Isaiah cried out. “Those who wait for the Lord shall renew their strength. They shall mount up with wings like eagles. They shall run and not be weary. They shall walk and not faint.” They’ll have this power and wisdom when they wait for the Lord, they will have this power and wisdom to be able to continue to thrive in their lives. Not those people who are waiting, who know how to wait. It’s not because their life is necessarily better than other people. It’s not necessarily because their life is easier and more comfortable than other people. Nobody’s life is given to them on a silver platter. We all go through difficulties and hardships, and even for those people who wait for the Lord, hope for Lord go through the exact same problem as anybody else. But somehow those people who wait for the Lord and who hope for the Lord, have the strength to persevere through their trials and difficulties and hardships. They don’t easily give up. They can persevere. They continue to pursue their life even though it is difficult because they experienced the power that fills them up. That is the power that lifts them up and lets them rise up like eagles. Young people learn to hope for the Lord. Learn to wait for the Lord. More than anything else, learn to wait. You’ll become very strong people. You will receive all kinds of challenges in your life, but you will be able to handle them if you know how to wait and how to hope for the Lord. Tomorrow will be better than today, is not a guess. That is not our wishful thinking. Oh, I wish that tomorrow is better than today. It’s not wishful thinking. It is your faith confession and it is also your commitment. 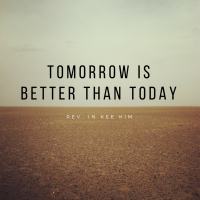 Yes, tomorrows got to be better than today. The reason the early Christians could survive through persecutions, martyrdom and hardships and all kinds of severe situations was that they believed that tomorrow will be better than today. They had this confession that tomorrow will be better than today. That’s how they survived and persevered. Christian life I believe that it is not just maintaining the status quo. It is our struggle to make tomorrow better, to make our future better. When I say tomorrow will be better than today. I’m not talking about your life situations. I’m not saying that your life situation will be better tomorrow than today. St Paul life situation became worse after he met Christ. I’m not talking about the life situations, but you will change. Tomorrow you will be better. So, you’ll be able to handle your life situations better. Saint Paul got better and better every day, even though his life situations changed. That’s a winner. Be a winner in that way. Be strong in that way. Don’t let your circumstances crushed you down. Believe that tomorrow will be better and then God will make you better. Jesus said this parable, “the Kingdom of heaven is like a mustard seed that someone took and sowed in his field it is the smallest of all the seeds, but when it has grown, it is the greatest of shrubs and becomes a tree so that the birds of the air come and make nests in its branches.” What does it tell you? Tomorrow will be better than today. It starts with a small seed. Have you seen mustard seed? It’s so small that you cannot even see it very well. And tomorrow it will be like a tree where the birds of the air will come and find rest. Maybe you start with a very smart person who is very selfish and self-centred. You only think about yourself in the beginning, so small, but later you become a big person. A bigger person so that other people find rest in you. That should be what our life should be like. We cannot continuously be selfish and self-centred and just ask for something to be given to me, but you will become a bigger person so that you are not just receiving person. You become a giving person at the end. Our life must change like that. When you’re more immature, when you’re young, yes, of course, you will only think about yourself, but as you grow mature, more mature, you think about other people, so you become a bigger person in this way. This is what the Christian journey is all about. Sometimes we feel like we are stuck. Sometimes you feel so tired and drained and sometimes we see no future and there’ll be no way out, that when you wait for the Lord. Instead of letting yourself be discouraged, that is when you wait for the Lord, hope for the Lord. And you will have to meet God who gives power to the feet and strengthens the powerless. When you look to God, you will have hope. Hope is not something that you can create on your own, only when you look to God, that God can give you the hope and with that hope you wait, and you’ll become a bigger person. And the hope will give you a new strength. God wanted to teach this to the Israelite. He showed all kinds of things to the Israelite. He made a way when there was no way it was possible. For example, in the middle of the ocean, God made a way and then when there was no food, God gave them food and God gave you the water in the desert. He gave everything for them so that they know how to wait for the Lord, but when Moses disappeared into Mount Sinai to get the 10 commandments, he wasn’t around for a while and these people cannot wait for the Lord. What did they do? They made a golden calf and dance around the golden calf. You know in other words, “I have to make my own destiny now This Moses guy? I don’t know where Moses says, let us create our own idols, our own help, and this golden calf will lead us from now on.” They didn’t know how to wait for the Lord. they created their own destiny. Don’t do that. When you’re desperate, when you feel powerless, wait for the Lord rather than creating your own resources, your own idols. Don’t take care of yourself by yourself. You’ll fall into a deeper problem. Look to God and God will give you hope. And with that hope, wait and you will become strong. God will strengthen you. Isaiah wrote today’s passage when they were captivated, Israel because of their sins and problems. They were invaded so they were all captives by Babylon. So, Isaiah wrote this when they were in Babylon and they lost their country. They lost their temple. They lost their identity. They lost everything. So, in that battle, in the foreign country, Isaiah cried out, wait for the Lord, wait for the Lord, and that Lord will strengthen you guys. Wait for the Lord. To all of us, God tells us to wait. And when you have this waiting heart, your tomorrow will be better than today. That waiting heart, that yearning is crucial in living a good life. Life without yearning is dead life. When you have that yearning to make your tomorrow better than today. Yes, your tomorrow will be better than today. As the deer pants for the water wait for God. When you come to worship, wait for the Lord to touch you, to speak to you, to empower you, to open your eyes, to give you the wisdom. And God will give you that secret wisdom to you as you seek the Lord. There was another prophet after Isaiah. His name is Jeremiah. Jeremiah cried out like this. Call me and I’ll answer you and will tell you great and hidden things that you have not known. Call me I will show you the secret, secret of life. All the YA, as you enter university and you’re dealing with all kinds of new challenges, learn to wait for the Lord. Learn to hope for the Lord and Hi-C now your beautiful life is ahead of you but also at the same time, all the challenges will be in front of you. When life’s difficulties come, learn to wait for the Lord and he will help you. He will guide you. And you will go, “Oh God is alive.” God gave me this wisdom and this strength that I never knew before. God will do that. And all of us, those who wait for the Lord God will strengthen you. Let us trust in the Lord who gives the strength to the faint and power to the weak.